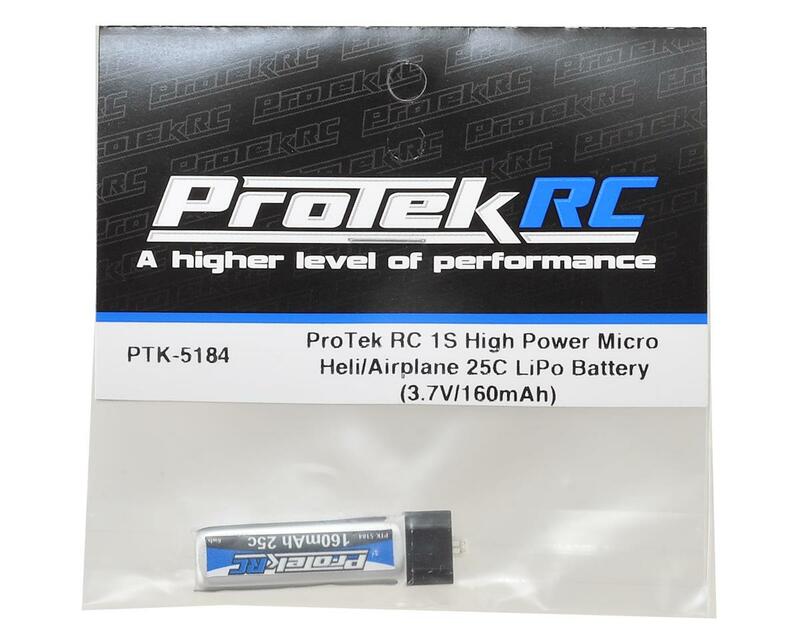 This is the ProTek R/C 1S 160mAh, 25C Micro Helicopter/Airplane Lithium Polymer battery pack. 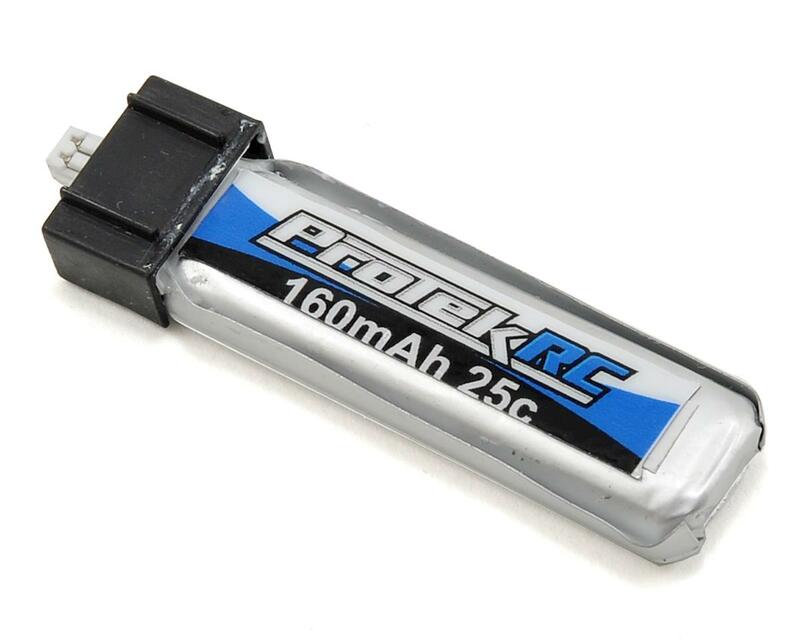 This pack will fit E-Flite and Parkzone products that use 70mah to 150mAh battery packs. When used in aircraft that normally use 70mAh batteries, these batteries will provide better performance and longer flight times! NOTE: When using high energy Li-Polymer Batteries, please do not over-discharge or over-charge batteries as this will result in over heated batteries. Discharging capacity can't exceed 80% of the max capacity of the pack after full charging to ensure a good cycle performance. It is recommended to fully charge a brand new battery before using and only discharge the battery 50% for first 5 cycles. Always monitor flight time and/or set a low voltage warning on ESC (End voltage cannot be lower than 3.2v per cell) Do not use the battery that has too low a voltage. Good battery. I use these in my nano cp x and fly mostly hard 3D. I get about 6 1/2 to 7 minute flights charging at .3amps. These batteries seem to work great! Nice long flight times, great power. I use them in my mcx and mcx2. They are longer than stock and to keep the CG right you have to push them all the way towards the front and they may interfere with the servos. I stuck a sliver of fuel tubing between the landing skids and the frame to give it more room. I bought 5 of these batteries for use with a BNF Basic mSRX kit. I don't have experience with the stock 150mAh batteries nor any others so I dont have good comparison other than avg flight times people have posted on forums. I get about 5-7 minutes of air time which consists of lots of hovering and scooting around the hangar bay of the boat I'm on when the real helos are off flying. They have an interesting "power curve" where they fly for about 3 minutes with no noticeable loss of power then there is a sudden drop where I have to add just a little more juice for the second half of the flight until right before the LVC kicks in it starts to feel flat. I charge these lower than 1C because my charger only adjusts in .1 amp increments and I always round down when charging (it ranges from charging 1 to 5 batteries at once in parallel depending on how much flying I do). Would I buy them again? Yes. Would I buy them over Turnigy batteries? Yes mainly because A Main has great CS so if I get a dud (which I feel is less likely than a HK batt) I can ship it back without paying out the nose for a $5 battery.